According to birthday tradition at my house growing up, early early early in the morning on our birthday we'd sneak into our parents' room and snuggle into our mom's side of the bed for a cuddle + the story of the day we were born. I can feel even now that special pocket of warm bed--my mom was something I worshipped just a little bit when I was a kid, like some regal princess or glamorous movie star, and getting to cuddle with her in her bed was always sort of magical. "[BLANK] years ago today . . . " That's how it always started. The particular details that followed might alternate a bit from year to year, but the gist was always the same. "He had the hairiest arms," my mother always tells me of the doctor who delivered me, "and then he said to me, 'You're so beautiful!' and I decided I really liked him." Always my mother ends by telling me, "You were just what I hoped for." Every October 2nd. It's kind of the best thing in the world. Two calls in particular stand out to me. The first, my first birthday at college, when I wasn't expecting the tradition to continue and then there she was, on the phone, and I sat there in tears of relief that I hadn't grown up that much already. The second, the year after Huck was born. That time my dad sat in on the call and chimed in every now + then with all these different details that I'd never heard before, like why he decided to make the scrambled eggs with bacon for breakfast, and which cartoon exactly it was on the TV that he watched while my mom labored. I sobbed that entire call. It's been fun in the years since to compare her birth story with me to my own birth story with Huck. Which was just four years ago today . . . err, last week . . .
"And then you were crowning. For forty five minutes." And then Brandon cringes. You know, the day of Huck's birth is incredibly sweet to me. But it's always in the days following his birthday that I start to get really nostalgic. Because those days following!!!!! Take last week, for example, as I did the laundry. I was folding these little boy undies and I caught myself thinking, Wow! Four years ago today . . . We had gone out for pizza, my stitches kept jabbing me in places where stitches should not jab people, and I was sooooo thirsty. I was fidgeting uncomfortably on the bench at the bra store and when the salesgirl offered me a piece of chocolate from the candy bowl I ravenously took 4 of them and shoved them in my mouth so fast because I WAS SO HUNGRY. ALL OF THE TIME. I'd let my mom hold Huck, but only for a few minutes because I was always so antsy to have him back in my arms the minute he left them. I hated even being as far away as the other room without him. I can remember that afternoon down to the second. All of those afternoons, actually, that whole first week. And that's how it's been for me every year. Those are the stories, man. It's a little harder to communicate those kinds of memories to a four-year-old than it is to list the events of an exciting hospital hero story. How do you describe that fresh, dizzy exhaustion? The slow-motion grasping of brand-new baby fingers; how fuzzy everything felt except those fingers, which I saw with such sharp clarity and intense focus? How do you explain nursing through incredible pain for that exquisite relief; and what it meant in the first place to finally be nursing this creature that I had waited for for so long? The tiny halo of peace that seemed to surround him always, where ever he was. I can't ever nail down that feeling in words, the way it felt when the nurse would wheel him in in his weird plastic buggy and I'd catch a glimpse of his profile as he moved across to the side of my bed and all I knew was this odd kind of reverence and an ache in my core from where he used to be. The way I could peer into those dusky deep blue eyes and see the oldest, sweetest soul. Oh, that first week. Awful and wonderful, fairy dust and ice packs. Someday Huck may have a baby of his own. What a weird, wonderful thought. I'm sure his memories of the day his children are born will be the most special to him. But I guess I've been realizing that I hope his memories of their first week home together afterward will be that much sweeter. Those are the secret moments we had together that I want to share with him every year. Those are the secrets that I want to build our relationship on; the secrets he'll recall when he experiences them for himself for the very first time. You were five days old. It was Halloween. I had you strapped to my chest in this silly orange wrap that I could never put on without help, and we had gone out together for a short walk through the 69th Street Halloween party. You and me and Grandma Jumie and your daddy, off to go see some Halloween costumes. It was a very exciting night. All the neighbors and doormen were outside smiling and laughing, the weather was just about perfect, there were dancers rappelling down the sides of the brownstones in Peter Pan and Captain Hook costumes . . . your dad bumped into Tina Fey randomly and didn't think to tell me about it until way way later. . . but even though it was so fun, and I loved being out and breathing in the fresh air, I decided to go in early with you while your dad and Jumie stayed out a little longer. Because being with you in that special sacred space where it was just us two was more perfect and more exciting to me than all the mini Snickers and all the Halloween parties and all the feminist celebrities that I adored at the time, all rolled into one. The minute I got you upstairs and had you unwrapped from that silly Moby, it felt like Christmas morning. It felt like I had just unwrapped the most thrilling present. And I was just so, so, so happy to be there, alone with you, just looking at you. Happy Birthday, baby face. Your mama loves you. What a sweet tradition. Please keep it up for Huck each year, I know he will remember and look forward to it just like you have. My little boy just turned five and believe me, kids remember things! so sweet. don't break the tradition!!! I found myself in many of your posts. When you were affraid or confused, when your biggest wish was to have a child. Sometimes it hurts but finally I see that sweet face you have and I know that you are a lucky mom and Huck is a lucky boy having such great parents as you. I hope one day I'll my own sweet baby to tell him the story of his birth. Me and my siblings use to do the very same thing as well.......although with three of us trying to get in at the same time...I dread to think of the pushing and shoving that went on!! It's crazy how quickly things change. My boys are now just 4 and 19 months, and although these days I love the stages they're at, I can't help but get dewey-eyed thinking about when they were tiny. I should write about that, actually. I've been meaning to for a while... Also I've never written down their birth stories (although the second time around I took a notebook with me to jot little bits here and there so I wouldn't forget). I should do that too before all those details are completely lost in time. Thanks for the prompt! Thank you so much for sharing! That was so heartfelt and wonderful. I don't have children yet but I'm going to save this and remember it when I get there and I hope it is soon.. I read this post while cuddling my 5-week old, and the 1st few paragraphs made me cry. This makes my heart ache and sing at the same time. We haven't yet reached the end of our waiting but you give me so much hope that when we do, it will be all the sweeter because of the wait. We have the same family tradition, except Mom & Dad share the story over birthday dinner, without bothering to censor any gory detail. Made me have a tough appetite, hah. So sweet. What a tender and meaningful tradition. 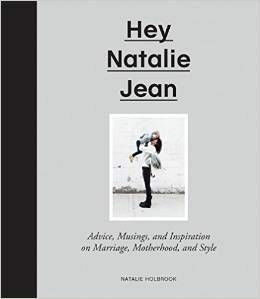 OH natalie! This is the dearest, the sweetest. 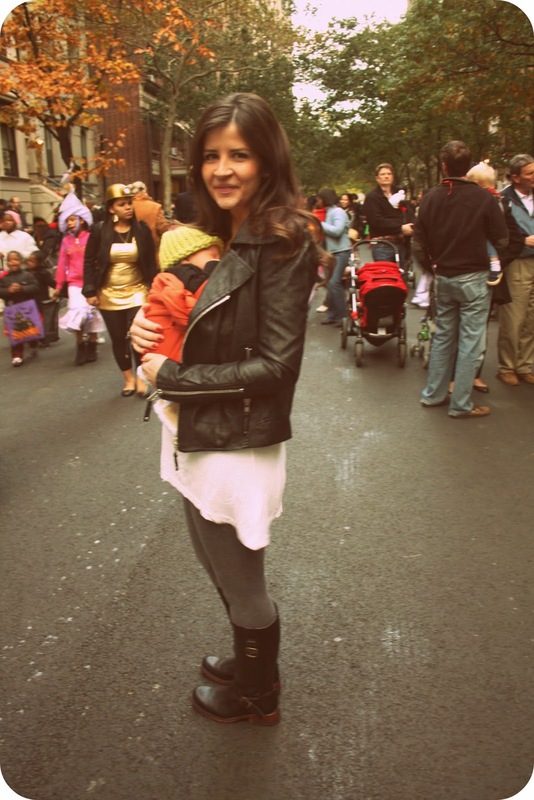 I've always wanted to be a mama and now i'm craving (even more) that sweet desire. Thank you for your raw, honest words. They inspire me, a learning, growing, not yet thriving, twenty year old. Thank you for the "keepin' it real" attitude you always put out. Henry Holbrook is one lucky babeh! XO. i couldn't even read this whole post because i'm at work and i knew i'd cry. but i did read the end story, of huck's first halloween. and it was so sweet! my baby girl was born 2 weeks before halloween last year (she just turned 1!!). 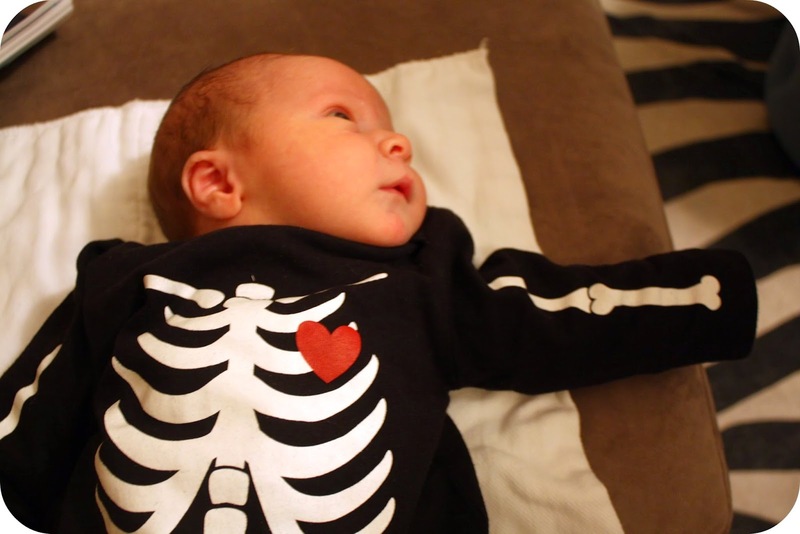 and she wore that exact same skeleton onesie last year on her first halloween (but in pink). just love this. so sweet. I can't even express how beautiful and happy this makes me. I can feel through this how much you ached to have huck and now you do! And he's the best. Thank you for sharing, it give us hope that all the waiting will eventually be worth it. oh boy, this one got me good. I completely agree. Those first few days at home, the haze of love and pain and wide-eyed wonder; it's a drug. 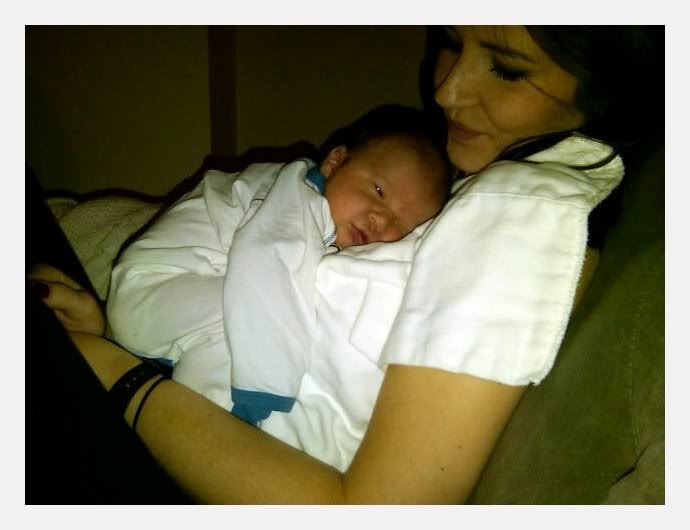 I'm always so jealous when people have a new baby, because I want to have that first week back again.